Fortunately, accident statistics reveal that electrical arc accidents are not all that common. However, if they do occur, electrical arcs can severely endanger the lives of people close by. Petra Brückner (Head of Product Development) and Susen Lemnitzer (Technical Project Manager), our protective clothing experts at uvex safety textiles in Ellefeld, Germany, recognise the risks involved and, crucially, know how to minimise them as well. Some of the more visible effects of electrostatic build-up are familiar to us all: hair which stands on end when rubbed with a balloon or the occasional electric shock when closing car doors. However, there are some types of electrostatic build-up and discharge which could cause greater harm. For example, when electronic components are involved or where people are in industrial explosion hazard areas. A newly introduced test standard for safety gloves will now govern threshold values and test conditions. Personal protective equipment (PPE) is subject to a raft of regulations, rules and standards. For example, if a glove is designed to protect against mechanical risks, the criteria regulating the corresponding certification are contained in the industrial standard EN 388:2003. Where chemical hazards are concerned, standard EN 374:2003 applies. In the past, there has been no binding standard to govern issues such as electrostatic build-up and/or fire and explosion hazards. Technical regulation for operational safety TRBS 2153 may well prescribe that the contact resistance of a glove must be less than 100 megaohms (108 Ω) for zones 0, 1, 20 and 21 of explosion hazard areas, but it does not contain any description in relation to test methods and criteria. However, standard EN 16350:2014, which deals with electrostatic characteristics of protective gloves, will come into force on 1 July 2015 – better late than never! What is the state of play regarding ESD requirements? The fact is that there is currently no standard for electrostatic discharge (ESD) and therefore also no clear, valid ESD labelling for protective gloves as is the case for protective clothing and safety footwear, for example. In this regard, the standard DIN EN 61340-5-1 applies, but it is not valid for protective gloves – even if the odd ESD symbol may be found on gloves in retail stores. However, gloves that have been tested and certified in accordance with the new electrostatic standard can now be used without qualms in areas which require ESD product protection. What exactly are the differences between ESD standards DIN EN 16350, DIN EN 1149-1 and DIN EN 61340-5-1? Symbol/pictogram none Symbol with pictogram Symbol with ESD pictogram Warning: does not apply to safety gloves! For which areas of application are certified safety gloves appropriate? Gloves which have been tested in accordance with EN 16350:2014 can, among other areas of application, be used in explosion hazard zones such as refineries. Due to a high degree of conductivity, electrostatic build-up on wearers can be effectively avoided as long as the grounding chain, which consists of gloves, PPE, footwear and the ground, is uninterrupted. Inadvertent electrostatic discharge can also have negative effects in the manufacturing and assembly of delicate products such as electronic components, which may suffer permanent damage or even be destroyed by such an event. Safety gloves tested in accordance with DIN EN 16350:2014 are also suitable for use in this area of application. 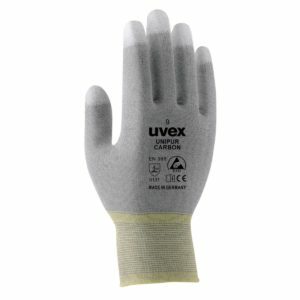 Does uvex also have certified safety gloves? uvex responded to the new protection standard for electrostatic properties by developing its own uvex unipur carbon. These safety gloves are ideal for lightweight working environments and remain within all threshold values and fulfil the conditions prescribed by the standard, as well as offering exceptional haptic qualities and ensuring climate comfort. In the next few weeks, the uvex rubiflex ESD safety gloves combining electrostatic discharge capabilities and chemical protection will be added to the uvex product portfolio. This product is currently in the process of gaining certification. The uvex rubiflex ESD is perfectly suited for use in paint workshops, the colour and printing industries as well as in the oil and chemicals industries.